Aberdeen 7-pc. Dining Set If you're looking for something with a casual cottage vibe, you'll love the Aberdeen 7-piece dining set! This collection is a stunning example of a country casual retreat at its finest. Distressed finishes offer worry-free care, so you can focus on entertaining instead of dings and scratches. Topped off with features like the plank-style tabletop and the two-tone chairs, the Aberdeen creates a charming dining experience. If you're looking for something with a casual cottage vibe, you'll love the Aberdeen 7-piece dining set! This collection is a stunning example of a country casual retreat at its finest. Distressed finishes offer worry-free care, so you can focus on entertaining instead of dings and scratches. Topped off with features like the plank-style tabletop and the two-tone chairs, the Aberdeen creates a charming dining experience. L: 24.5" x W: 20.5" x H: 30"
Chairs feature polyurethane-foam-padded seats covered in soft and durable, 100% polyester upholstery for a stylish finishing touch and extra comfort. I found it! Was delivered by two gentleman that were very friendly and careful. Tables and chairs are gorgeous and seem to very strong and sturdy. Salesman that sold a piece was amazing too- so kind and honest but also very knowledgeable... love his eye for design! Exactly the dining set I was looking for! Love the distressed finish. Chairs are very comfy. The shopping experience was smooth, courteous saleslady who was very helpful, patient. After months of searching for the perfect table, we just had our Aberdeen dining set delivered this week. The table and chairs and dining server are very well made and are very solid pieces of furniture. I am so happy that we bought this set and look forward to all of our family meals around this table. The furniture is great! The delivery guys were very careful not to damage anything. Impressive! The furniture is very well made and very sturdy. We love it! I really love the set and it’s very substantial. Well made and has a farmhouse, yet modern look. It lightened up my kitchen area. I am so pleased with this set. It looks beautiful in my dining room. I love it! I always have been pleased with furniture from Raymour and Flanigan. We sought this set in the show room and were unsure if it would fit in our kitchen. But we measured and I must say it’s so fantastic. It fits perfectly and my family and myself love it. This set can be used in a kitchen as we are or a dining room. This set is amazing and perfect we are using it as a kitchen table but it’s more than comfortable. Love everything about this set!! So beautiful and functional! We bought the dining set for our daughter. It’s perfect, very sturdy and looks beautiful in her home. It was delivered the day after we bought it and the delivery persons were professional, polite and helpful. Great experience. The whole buying experience at Raymour & Flanigan could not have been better. The sales associates was great. Didn’t follow my girlfriend and I around the store nor try to push us. Everything regarding the sale was explained clearly including the warranty and protection plan. We are also extremely impressed with the quality and craftsmanship that of the furniture. I can honestly say that it was the best piece of furniture I ever bought as well as the best experience I have ever had. Thanks Raymour!!!!!! I searched a long time to find the table I wanted and this is exactly what I was looking for. it is really well made and it feels sturdy. Gabby, my sales person was extremely helpful and patient with me as I made my decision. Love my neat dining set and fireplace ! Delivery went perfect ! Salesman was very helpful! Love my new table and chairs. This set fits our modern country kitchen perfect! The seats are super comfortable and the height of the table is just right. Can I clean the table with a wet sponge? BEST ANSWER: We recommend the following care for this table. Clean with damp cloth, and do not use furniture polish. All spills should be cleaned up immediately. How many people can this table seat when the leaf is in? BEST ANSWER: With the leaf included, the Aberdeen Dining Set will comfortably seat up to eight people. Does the top of this table scratch easily? I have 2 toddlers and need something durable that won’t show scratches/marks. BEST ANSWER: We have the 'toddler end' of the table covered in plastic, but no, I would say the surface does not seem easily scratched or marked. We have decorations on there, the toddler, the cat, and it still looks as good as new. The concern for a toddler, if you don't cover their end, it is easy for food to go into the 'cracks' which are part of the design. So you would need to cover up or get a good scrub every once in awhile. No, the table top quite durable (I have a 5 year old). 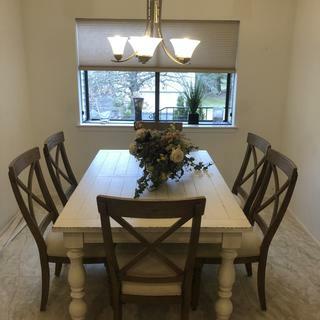 I love the table quite a bit, but the chairs were a bad choice for kids; they are white/cream and stain easily (even with scotchguard) and the seats are really deep and I find them uncomfortable to sit in properly (the backs of the chairs are bowed out so it feels very unnatural to sit back). I've had this set for over a year now and love it. It does not scratch easily and if you do get a scratch it is not noticeable as the finish is a somewhat weathered and textured look anyway. It is not a smooth surface so my kids (ages 14, 13 and 10) just use a place mat at the table when doing homework. The table has a distressed finish with groves/lines throughout. Zoom in on the tabletop so you can see what I’m describing. I haven’t had any issues with scratches or marks. It does not scratch easily. It is a very thick, well made table. But in case you can’t tell from the pictures it is already “stressed” around the edges...part of the design. I have 2 boys and haven’t had any problems with scratching... it’s a tough, durable table. It’s got the rustic look too so there are some natural nicks. I love it! I have 3 kids and there are no scratches on the table after the first year.The chairs however absolutely need plastic covers to prevent staining. It’s a distressed look on top, we have a cat and baby and just keep a clear polyurethane cover on it and haven’t had any scratches to it. No, not easy but it is wood. A light scratch certainly wouldn’t hurt the table, would probably leave a mark on the darker wood chairs. It's pretty thick and durable, and so scratches aren't likely to show so easily. Hope this helps. No scratches! The rustic feel of the wood would cover any scratches easily. No I have no scratches and 4 grandchildren! I love this table! Can you use compostable wipes to clean the table? The first ingredient is water and then plant-based clearning agents. BEST ANSWER: Please refer to the recommended cleaning instructions: Dust with a soft, dry cloth. All spills should be cleaned up immediately.